Now that the Paris Climate Agreement has come into force, governments are rolling up their sleeves and beginning to work on its implementation, coming together to determine how to take the next steps to secure a sustainable future. This year’s conference, known as COP 23, will take place in Bonn, right beside the UNU-EHS offices on the UN campus. Between 6 – 17 November, 25,000 participants are expected to attend the negotiations and the hundreds of side events taking place across the city, making this a crucial forum for governments, climate researchers, NGOs, and the business community. UNU-EHS will actively participate in the conference: we will be hosting two press briefings, and our researchers will be leading various discussions about some of the key thematic concerns of this year’s conference. 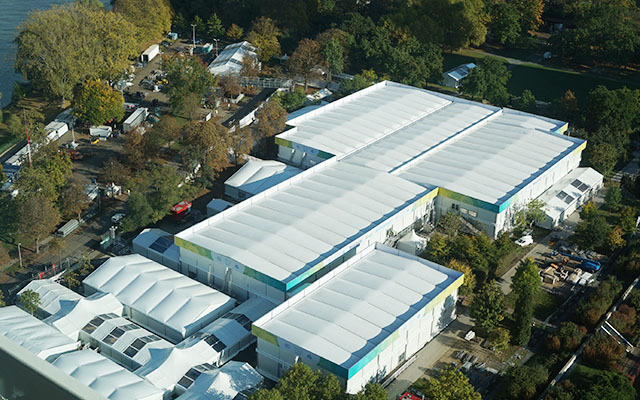 In the space below, you will find an overview of our activities at COP 23. It will be updated as more information becomes available. You can also follow us on Twitter and Facebook (@UNUEHS) to receive the latest information. This side event will serve as a launch of a joint publication between MCII and DIE (German Development Institute) on the added value of climate risk insurance for NDC implementation with a focus on resilience. Taking stock of the work of the Taskforce on Displacement halfway through its mandate: What are the key achievements and the main challenges? How can the work undertaken at the global policy level feed the development of the Taskforce recommendations on climate-related displacement? The film accompanies Prof Susan A Crate, who studies the effects of climate change on centuries-old indigenous communities. Susan will be present at the event and will be happy to answer your questions after the film. The event will be moderated by Matthias Garschagen, who currently works with Susan on the IPCC Special Report on the Ocean and Cryosphere in a Changing Climate (SROOC). Event: MCII Press Briefing: State of play on climate insurance: Is there progress at COP 23? Water is key for adaptation and mitigation and thus needs to be central in implementation of the Paris agreement. The side event will demonstrate recent tools, approaches and good practices in adaptive water management and climate financing for water. Joint side event by MCII, DIE, LMF (PIK). The Paris Agreement recognizes that innovation is critical for an effective long-term response to climate change. The side event will showcase different experiences in leveraging the power of innovation to enhance livelihoods and improve resilience to climate change. Event: Adaptation in motion: under which conditions can migration contribute to climate-change adaptation? There are two contrasting perspectives on migration and climate change: climate change receives much attention as a push factor for migration, and for resulting conflicts and crises. The notion of “migration as adaptation” takes a more positive perspective, recognizing migrants’ agency and potential contribution to adaptation processes. However, this has entered adaptation or migration policies only to a limited degree. The session brings together insights from research and policy and formulates key messages relevant for decision makers. It includes positive insights on migration, e.g. from migration as adaptation/development, but also critical perspectives such as migration and precarity; climate equity and justice; power and participation; or state responsibilities and human rights. The inputs will focus on conditions that enable migrants to be positive agents for change within climate change adaptation, and will provide valuable information for decision makers and policy choices. This year’s Showcase Event will recognize the 19 winners of the 2017 Momentum for Change Award that comprise of projects on sustainability, climate protection, environmental consciousness and social responsibility. MCII’s Livelihood Protection Policy (LPP) won the 2017 award in the category, Financing for Climate-Friendly Investment. The winners of the 2017 Momentum for Change Awards in the category “Financing for Climate-Friendly Investment” will present their work. Venue: Deutsche Welle, beside the UN Bonn campus. This workshop will discuss conceptual gaps, innovative frameworks for resilience measurement in the context of insurance, as well as potentials for collaboration regarding impact evaluations of insurance schemes.